What would you like to use the credit card for? What other household income is there? What are your monthly mortgage or rent payments? What are your monthly outgoings for: childcare costs; spouse and child maintenance payments; school fees? 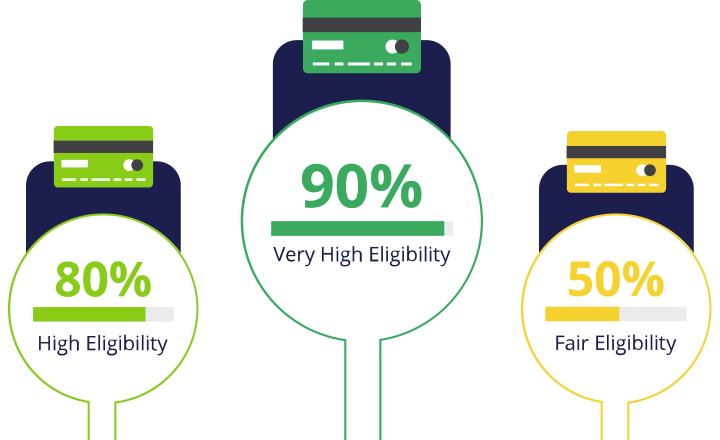 What is a credit card eligibility checker? Our eligibility checker uses the information you have provided to run a ‘soft’ credit check to estimate the likelihood of you being accepted for a credit card. Unlike applying for a credit card, it doesn’t leave a mark on your credit file as an application for credit. You can check your eligibility for credit cards if you are over 18 and currently have a valid UK address. To get the most accurate results you will typically need at least three years of address history, but there may be some cards available to you if you have less than this. We run the information you provide via our soft credit checking partners HD Decisions and Capital One. They cross reference a profile based on your information with the acceptance criteria of different credit cards. Is an eligibility check the same as a 'hard' credit check? It is not the same as a formal application for credit, meaning using this tool won’t be flagged to potential lenders as an application on your credit report. Our eligibility checker uses a soft credit check, which means it will look at the information you’ve provided and information on your credit report to estimate your credit score. This also means we can only provide an estimate of your eligibility for a credit card and cannot guarantee acceptance or rejection. Why do you need my personal and employment details? Your age, name and address are used to verify your identity and match it up to your credit file. As credit card providers care about the security of your income, employment status is used as a rough indicator of this. Some cards have minimum income requirements. To avoid inaccurate probability results, please ensure this is accurate. Your eligibility results are estimates based on information pulled from your credit profile on the day you perform the check. However these estimates may become less accurate as time passes, especially if you do anything that might affect your credit score. Our soft credit checking partners (HD decisions and Capital One) refresh the information they use to estimate your eligibility on a monthly basis. So, if you are looking at results that are a few weeks old, you should probably start again and do a new eligibility check to get more accurate results. If you have any pre-approved results, these are only valid for 24 hours from when you first complete the eligibility check.